Rated for 650 lbs, making it stronger than the surface its mounting to. When looking for running boards, often you have to decide between style OR functionality. Fortunately for you, Aries Automotive has introduced the all new ActionTrac Powered Running Boards. These electric steps provide an 8" drop step that swings down when the doors open, and tucks back flush when the doors are shut. This provides the perfect step for any vehicle when you need it, and fantastic styling when you don't. The Aries ActionTrac not only has a step that swings down, but the top is a step, too. 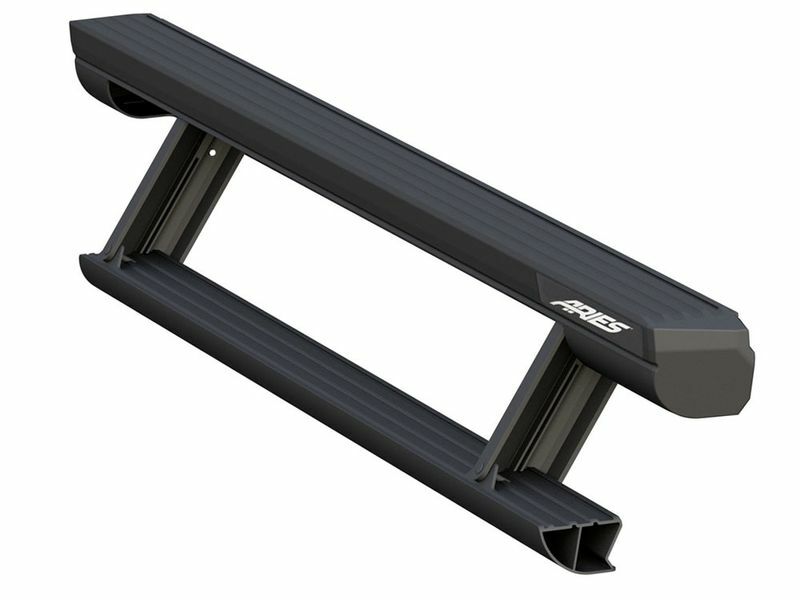 This means not only do you get a lowered step for convenience, but you also get a traditional running board step, making this perfect for lifted trucks or anyone who wants the extra convenience of two steps. The ActionTrac is powered by a single heavy duty electric motor, making the operation quiet and the boards maintenance free. That's a good thing too, considering they are completely sealed and weatherproof, making these built for on and off the road, with a thick black powder coat to protect against scratches and corrosion. These boards come with vehicle specific mounting brackets to make installation a breeze. Better yet, drilling and splicing are not required on most applications, making this powered step one of the easiest to install on the market. Just bolt it to the factory holes on your vehicle, and wire it using the supplied, easy to read instructions and you'll be showing off the boards in no time. No aligning of the steps are necessary. To top it off, these boards come with a limited lifetime warranty so you can be confident while purchasing that you're getting a product that'll last.